The Hairy Bikers Festival Feast - A pop up Wood Fired Restaurant Adventure will be at the heart of this year’s Festival, at the stunning Great Tew Estate, offering restaurant-quality festival feasting over the weekend of 13-15 July. As well as enjoying a delicious menu based on recipes from the pair’s BBC TV series and best-selling book The Hairy Bikers Mediterranean Adventure, the bikers will be cooking and sharing their stories for guests throughout the three days. The festival is expecting a lot of interest in this unique offering so early booking via the festival website – www.cornburyfestival.com - is advised. 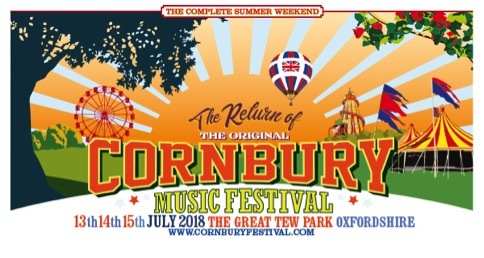 Obviously, guests will need to have a Cornbury day or weekend ticket to access this offer. Hairy Bikers Si King and Dave Myers have been cooking together for more than 20 years, travelling the world in the pursuit of great food. The stars of a string of hit television shows, and regulars on BBC One’s Saturday Kitchen, they are also the UK's most popular cookery writing duo – their book The Hairy Dieters: How To Love Food And Lose Weight even toppled 50 Shades Of Grey to top the Bestsellers chart in the summer of 2012! Weekend tickets (from) - £180 Adult, £215 with camping, £95 young person or over 70, £125 with camping, £30 child, £35 with camping. VIP options also available.